The King of Cobbled Classics, Paris-Roubaix, is this Sunday - Team and course news from Hell. Race news form the Scheldeprijs and the Vuelta al Pais Vasco with video. Top Story - No Roubaix for Mathieu Van der Poel. Other cycling news: Froome and Nibali at the Tour of the Alps, Shane Archbold returns, Victor Campenaerts Hour Record diary, Deignan in Yorkshire, Teams for the 2019 OVO Energy Tour of Britain, Verona hosts the Grandfondo European Championships and John Degenkolb video Profile. A fun packed EUROTRASH Thursday. As we know, Mathieu van der Poel will not be on the start line of Paris-Roubaix in Compiègne on Sunday. Very disappointing considering how the Dutch 'Superstar' has been riding in the Spring Classics so far. Last Sunday the young Dutchman had a slight mishap with his front wheel and came in contact with the pavement. After a long chase, he worked his way through the peloton, made it into the break and finished fourth. Not too shabby, maybe if he stopped jumping kerbs he might not break wheels. Anyway, he will be missed on Sunday due to his team not being invited by race organizers ASO. ASO director Christian Prudhomme does expects to see Van der Poel on the Roubaix cobbles in 2020. 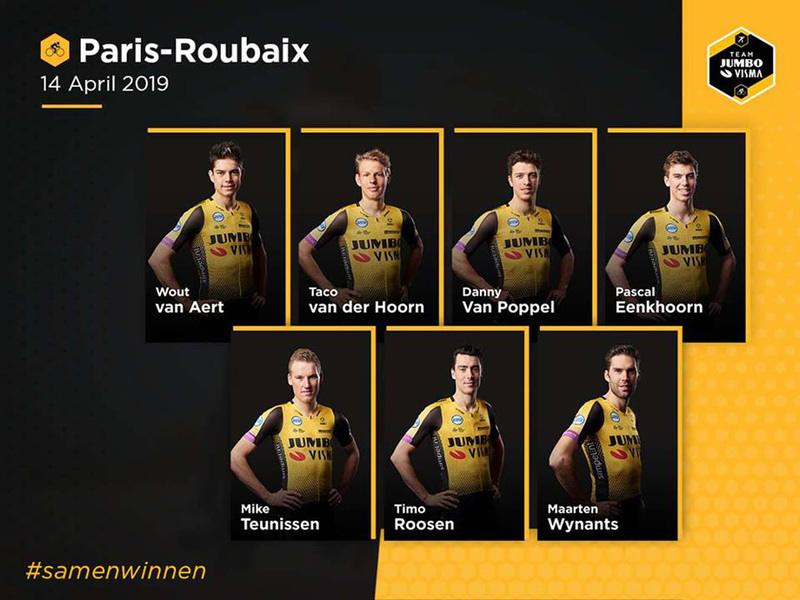 Maybe instead of inviting one of the French teams: Cofidis, Delko Marseille Provence, Direct Energie, Arkea-Samsic or Vital Concept-B&B Hotels and having Corendon-Circus in the Hell of the North, the race would be more of a spectacle, if that's possible. We will just have to watch the 'Boy Wonder' in Brabantse Pijl and Amstel Gold Race. Fabio Jakobsen (Deceuninck - Quick-Step) was catapulted by his teammates across the finish line first in the Scheldeprijs on Wednesday. 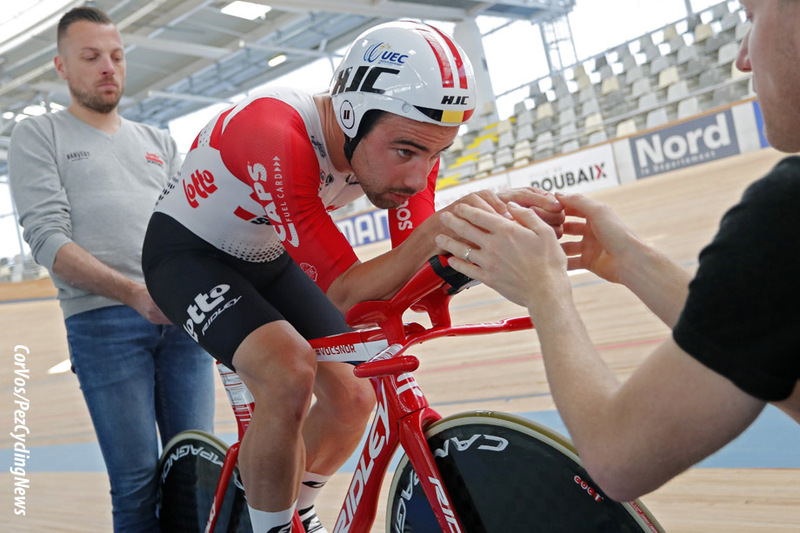 The 22-year-old Dutchman jumped in the final 200 meters to hold off Max Walscheid (Sunweb) and Chris Lawless (Sky) for his second consecutive triumph at the Belgian event. Flanders’ oldest race started again from the Netherlands and that spelled chaos minutes after the peloton got underway from Terneuzen, with the crosswinds shattering the bunch to three distinct groups, a strong Deceuninck – Quick-Step contingent being part of what soon became the main field with more than 150 kilometers to go. Some riders managed to come back, but things remained quiet for just a brief moment, echelons splitting the peloton and making for a hectic race until the riders entered Belgium for the final 60 kilometers. Before leaving the Netherlands, several riders were involved in a crash, Fabio Jakobsen being among those to hit the deck. Luckily, he escaped almost unscathed and after a fast bike change he made it back to the peloton, helped by his Deceuninck – Quick-Step teammates. Davide Martinelli took over and put in a mammoth pull, slotting Michael Mørkøv and Fabio Jakobsen in a perfect position under the flamme rouge. 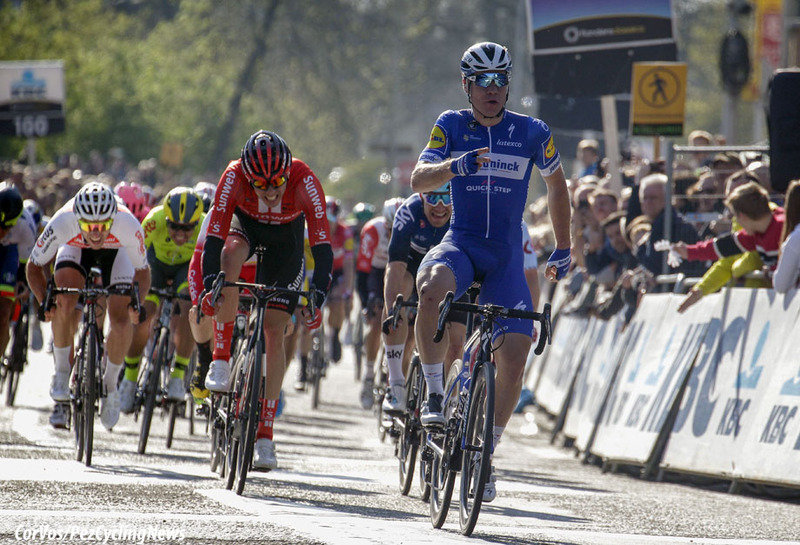 The Danish Champion, one of the best lead-out men in the business, then did what he knows best, launching the defending champion, who came around and powered past his opponents, netting Deceuninck – Quick-Step’s 22nd victory of the 2019 season. Scheldeprijs winner, Fabio Jakobsen (Deceuninck - Quick-Step): "To be on the winners’ list here with two triumphs makes me very happy! The guys did an amazing job from the start, for which I am extremely grateful. I knew that I had a strong sprint in my legs and riding with bib number one on the back gave me a lot of confidence, and at the end of the day I am glad I could repay my team for their hard work. I was on the mend after Volta ao Algarve, where I got sick, so to get this win is very important for me, but I wouldn’t have done it without my teammates, who totally bossed the finale and showed how strong they are. The race was very tense, with the echelons and the narrow roads which only added to the nervousness of the bunch, but I remained calm and focused on doing my job. There was some pressure today on our shoulders, but we thrive in these conditions. I am feeling much better now and I look forward to continue building on this result. Next week I will be at the start of the Tour of Turkey and hopefully will get in the mix for other nice results together with the Wolfpack." 2nd, Maximilian Walscheid (Sunweb): "We made the tactic to split the race in two parts, with the crosswinds and then the sprint. Both parts worked well and in the crosswinds I was never really out of position thanks to the team. In the local lap, the team was very committed and I pushed the guys to give it their all in the finale. We had a few difficult situations, including the crash of Roy, but when I saw him coming back to the front in the final lap, it showed that the commitment of the team was really clear. They brought to me one kilometer to go and from there I was on my own. I think we managed really well and came super close to the victory. It was a good day for us overall." 3rd, Chris Lawless (Sky): "I spent a bit of time in the wind just making sure I was in the right position in that last kilometer. And when the opportunity arose I just hit out. I think technically I did a better sprint than last year. I expect the power numbers will be better but it’s the same result. That’s just how it plays out sometimes. It’s a bit of a bittersweet result. It’s nice to be on the podium and to get third two years in a row – but you always hope for that couple of steps better. Most of the day I was at the front and I was able to make every front split. I had a puncture when the race was split into two groups, shortly after (Kristoffer) Halvorsen crashed. It was a difficult moment and luckily the bunch wasn’t going too fast at that point. I got a neutral service wheel but that tyre was rubbing the frame. So it was a case of waiting for the team car to come up and I’d already been dropped from the second group at that point. Luckily I was able to get back on and it was pretty simple after that. (Owain) Doull did a really good job of looking after me on the last lap of the circuit before the cobbles. On the cobbled sector he rode pretty hard as there was a bit of wind, so it was useful for me to be on his wheel. Then Gianni (Moscon) took over looking after me after the cobbles. He took me to a kilometer and a half to go. Then I just tried to surf the wheels. It was about as close as you could get to last year in terms of the final and how it played out. I had to hit out a bit early. It’s one of those things – when you’ve got such strong lead-out trains there such as Bora and Quick-Step – you’ve got to do something different to try and out-wit them." 14th, Timothy Dupont (Wanty-Gobert): "I was in the second group after Wesley Kreder’s crash but I did never panic. I knew we were a strong group and we would come back. In the final I had a good feeling but I got too fast in the wind. I never could follow the favorites’ wheels and I got stuck in the sprint. I am disappointed by the result but I am confident for Paris-Roubaix. My feeling and shape are good. I am looking forward to this Thursday’s recon." 10. Matteo Moschetti (Ita) Trek-Segafredo. 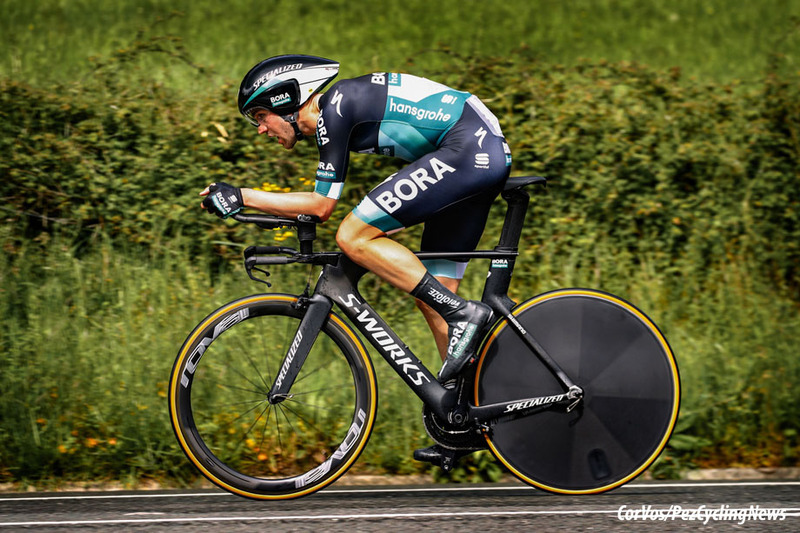 In the tough opening time trial Stage 1 of the Tour of the Basque Country, Bora-Hansgrohe's Maximilian Schachmann beat Daniel Martínez (EF Education First) by 9 seconds to take the overall lead. Michal Kwiatkowski (Sky) was third at 10 seconds with Julian Alaphilippe (Deceuninck - Quick-Step) at 12 and Adam Yates (Mitchelton-Scott) in fifth at 16 seconds. The 59th edition of the Tour of the Basque Country commenced with an almost 12 km-long individual time trial around Zumarraga. It also marked the first time that Itzulia has featured a race against the clock as an opening stage. The first part of the parcours was not particularly demanding, however, 3km before the finish, the riders had to traverse a 2.3km-long ascent with an average gradient of almost 10 per cent. Enric Mas (Deceuninck - Quick-step) led the standings for quite some time, having completed the course in 17:34. Patrick Konrad left the start house, and after cresting the only climb of the day, he was only 2 seconds behind the provisional leader Mas. He was able to take more time out of the Spaniard in the last part of the course, and as a result he set a new best time of 17:29. Max Schachmann (Bora-Hansgrohe) was able to put in a very strong performance and he bettered the time of his teammate by 19 seconds. He reached the finish in 17:10 minutes, and in the end, that was enough to seal the stage victory, and the yellow jersey of the leader in the general classification. Stage winner and overall leader, Maximilian Schachmann (Bora-Hansgrohe): "This is my third win in this season alone, and it’s really something special. It was a difficult time trial, and I didn’t completely know if I could pull it off, particularly in such a strong field which also contains riders of the calibre of Alaphilippe. We’ve come to this race with a very strong team, and therefore we have several options. And of course we have come here with big ambitions and we also want to achieve more in this race." 10. Hugh John Carthy (GB) EF Education First at 0:31. Julian Alaphilippe (Deceuninck - Quick-Step) won Stage 2 in an uphill sprint from Bjorg Lambrecht (Lotto Soudal) and Michal Kwiatkowski (Sky). 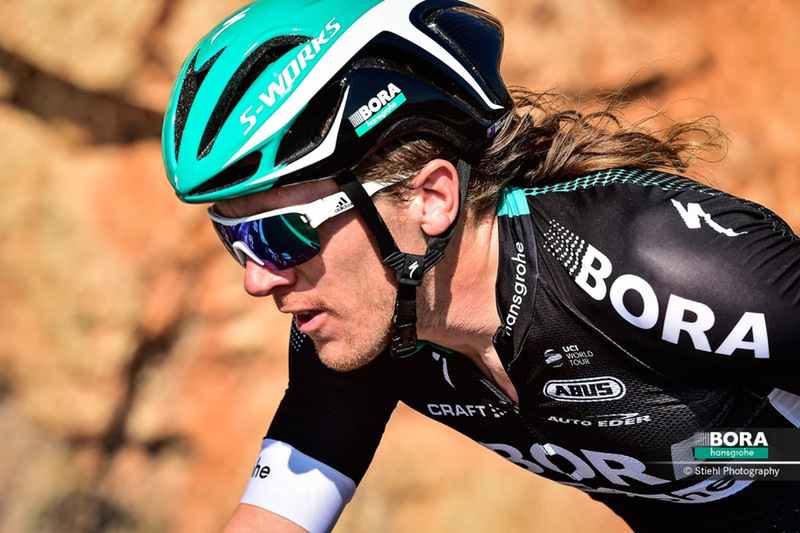 Maximilian Schachmann (Bora-Hansgrohe) finished 6th to hold his overall lead. The second stage from Zumarraga to Gorraiz was 149.5 kilometers of tough climbs and some rough tracks and an uphill finish. The break of Garikoitz Bravo, Julen Amezqueta, Julien Bernard and Darwin Atapuma took a maximum lead of 3 minutes. But the peloton caught them with 50 kilometers to go. At the first section of unpaved track a few riders were dropped, but there wasn't any change for the GC men as they entered the final 20 kilometers. Astana put the pressure on which caused problems for Adam Yates who had a flat tire on the last gravel section. The Kazakh team were working hard for Ion Izagirre and Omar Fraile as Alexey Lutsenko was in trouble. Alessandro De Marchi tried an attack, but the Italian was not allowed any distance. In the uphill sprint it was Lambrecht who was first to make a move, but it was Alaphilippe who had the best sprint to take his eighth win of the season. Stage winner and 3rd overall, Julian Alaphilippe (Deceuninck - Quick-Step): "I didn’t know how things will go after the break I took following my Milano-Sanremo victory, but the legs felt good and I was very motivated to get the win. The day was a very fast and nervous one, despite being short, due to the presence of those unpaved segments, but we managed the situation perfectly and I could rely on a strong squad, which kept me near the front at all times, so a big thank you goes to them for their valuable help. The finish suited me and I was well-positioned going into the closing kilometer. With 200 meters left, I saw an opening and kicked out, and that proved to be the right moment. I am really glad that I could take the victory. My goal at the start of this week was to take a stage win, and now that I have done that, I’ll just take it day by day and see how things go, especially as the general classification isn’t an objective." 2nd on the stage, Bjorg Lambrecht (Lotto Soudal): "I think riding on these gravel roads was more pleasant at the front than at the back of the bunch. I actually enjoyed doing it, because I like technical courses like these. After the first long section, the peloton split, but afterwards my teammates were able to return. The team worked really hard today to keep me at the front. In the sprint I wanted to surprise the others and when I attacked, I immediately had a gap. I never looked behind, but I knew that Alaphilippe was still there. He passed me and I could not stay in his wheel. Nevertheless, I just kept sprinting until the finish line with all the strength I had. All in all, I am satisfied with this second place. This is the first time that I have achieved a podium spot in a WorldTour race, so I am proud of that. This morning, I did not think it would be possible, but now it is on my palmarés. Tomorrow's stage is a bit similar, but less steep in the end. I will give my all again and I will see how it unfolds. I hope to have the same feeling I had today for the rest of the week. 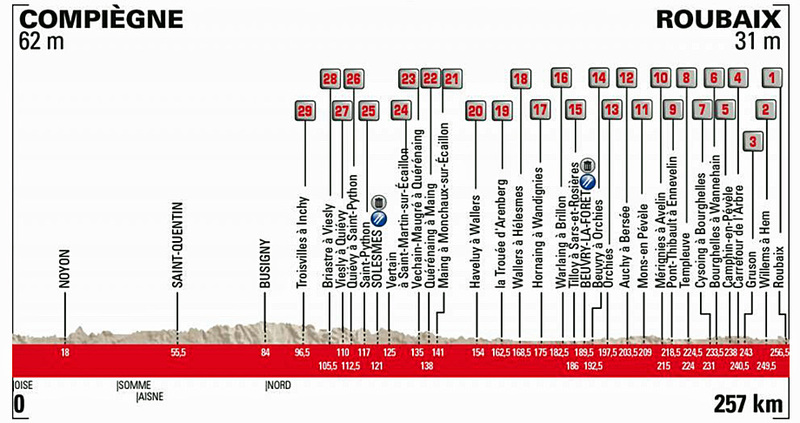 If I can go to the Walloon Classics in this shape, I will be able to help Tim Wellens and Jelle Vanendert really well. I trained hard to be good in this period. In Catalonia, I had some problems with my back, which obstructed me from going to the fullest. Meanwhile, things are getting better, so let's hope those problems are gone now." 6th on the stage and overall leader, Maximilian Schachmann (Bora-Hansgrohe): "Congratulations to Alaphilippe. Today I didn’t really have a big chance. In the end, you needed to have enough left in the tank, and of course also the right timing. Particularly on a final climb like this, it all came down to the legs. Tomorrow we have a long stage ahead of us, and it will be a different type of race. I am sure, that it will be a challenging stage, but we will continue to do our best." 10. Pieter Serry (Bel) Deceuninck - Quick-Step. 10. Emanuel Buchmann (Ger) Bora-Hansgrohe at 0:37. 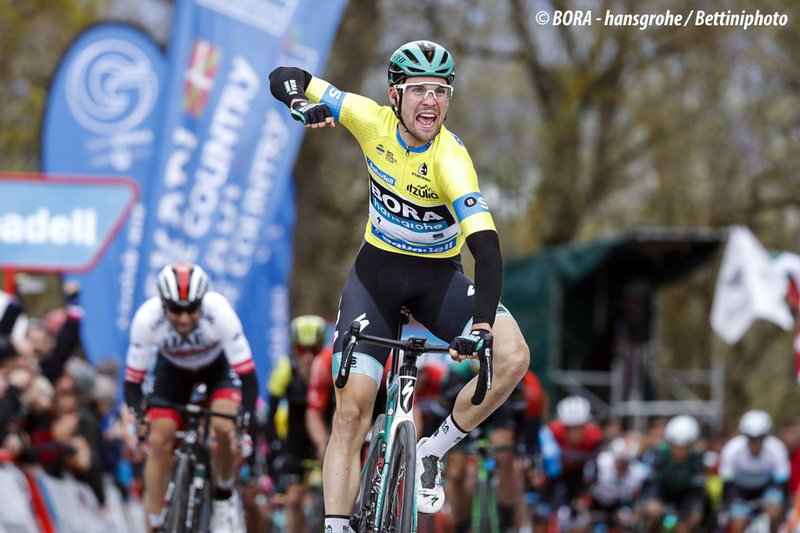 Maximilian Schachmann (Bore-Hansgrohe) won his second stage of the 2019 Tour of the Basque Country on Wednesday and held the overall lead. On the difficult finish in Estibaliz, he was the fastest in the sprint from a reduced peloton, ahead of Diego Ulissi (UAE Team Emirates) and Enrico Battaglin (Katusha-Alpecin). Julian Alaphilippe (Deceuninck - Quick-Step), who was sitting second overall, crashed and lost over 12 minutes. On the longest stage of this year's edition (191.4 km); five riders made up the early break: Julian Bernard, Toms Skujiņš, Nícolas Sessler, José Fernandes and José Joaquín Rojas. They were joined by Ben King, Bruno Armirail and Garikoitz Bravo by the first climb after 26 kilometers. By halfway through the stage the lead group had reached a maximum lead of 4 minutes. On the second climb to Opakua, after 134 kilometers, the escape had less than 2 minutes. Deceuninck - Quick-Step, Sky and CCC started to work together and with 20 kilometers remaining the leaders had less than 1 minute. While the last of the leaders were caught 5 kilometers from the finish, there was a big crash in the peloton. Among the fallers were Julian Alaphilippe, Michał Kwiatkowski and Geraint Thomas. Alaphilippe was one of the longest to be delayed, but did finish. Alexey Lutsenko and Diego Ulissi started the uphill sprint uphill, but it was Maximilian Schachmann, winner of the opening stage and wearer of the yellow leader's jersey, who put in a strong attack that no one could counter. Ulissi finished second, Enrico Battaglin was third. Stage winner and overall leader, Maximilian Schachmann (Bora-Hansgrohe): "I want to thank the whole team. The guys supported me, like always, very well, and this was clear to see yet again today. In the finale, there was a crash and I hope that all the riders involved are ok. In the finish, I had Gregor and Jay there with me, and they brought me into a good position. I had good legs and that allowed me to notch up the win and defend my leader’s jersey. Yesterday we had a meeting and we discussed what I could do better, and today I implemented that, and it worked. I feel good and am happy to be able to reward the hard work of my team with this win. We still have three hard stages ahead of us, and I hope that I will still have something left in the tank after today." 2nd on the stage, Diego Ulissi (UAE Team Emirates): "The final was complicated, but working together with the team we managed to get ourselves in a good position. I am satisfied with my sprint, it was excellent, but Schachmann was just better. I am pleased to have found a nice kick, it is a good sign for the next stages and, looking further ahead, for the Ardennes Classics." 4th on the stage, Marc Hirschi (Sunweb): "We tried to save as much energy as possible throughout the day. In the final it started to get really hectic and we did a really good job as a team to be well positioned. With the uphill finish I knew that if I was in a good position then I could get a good result. I was a bit unsure as to when to launch my sprint and maybe I went a little too late, but I still managed to finish fourth and I’m really happy with that. It gives me some extra motivation for the next stages and we hope that Sam can get a good result in the GC." Crash victim, Julian Alaphilippe (Deceuninck - Quick-Step): "It doesn’t look to be anything serious, but I have some abrasions and pain, so the team will continue to monitor me overnight. I really don’t know what happened, just that it was a touch of wheels in front of me and in the next moment I was on the ground. It’s the first time in my career that I crash at high speed, but at the end of the day I am happy I could finish the stage. The only thing that we can do now is see how things go and how I feel in the morning." 10. Grega Bole (Slo) Bahrain-Merida. 10. Sam Oomen (Ned) Sunweb. The big cobbled race of the season rolls out on Sunday for the most exciting flat race on the calendar. Read the PEZ Roubaix Race Preview HERE. Come back for more team announcements as they come in. 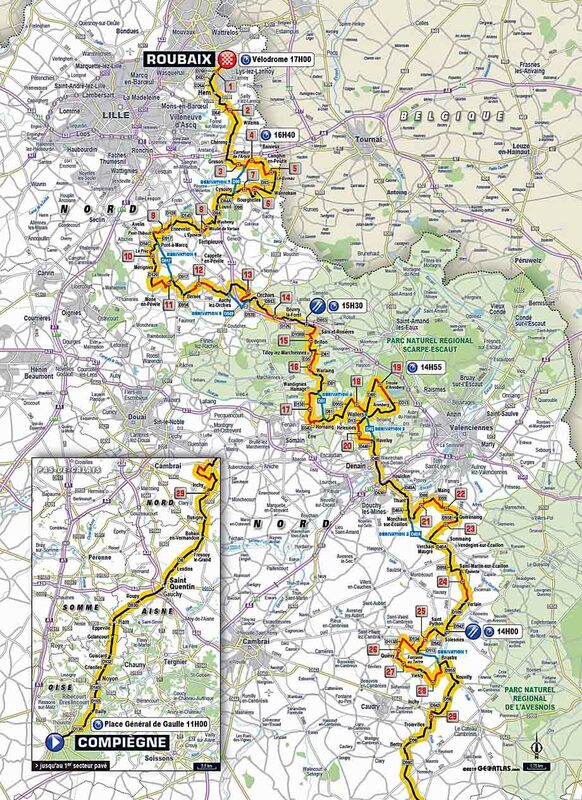 Following Christian Prudhomme and Thierry Gouvenou's reconnaissance of the course on 9 April, the organizers have rated the difficulty of the 29 cobbled sectors in the race based on their length, the unevenness of the cobbles, the overall condition of the sectors and their location. The Trouée d'Arenberg (km 164.5), Mons-en-Pévèle (km 212) and the Carrefour de l'Arbre (km 242.5) remain the only sectors with a five-star rating The shortening of the Troisvilles sector to its first 900 meters is the major change to the course for this year, while several other cobbled sectors in the first part of the race have also been altered. From this point on, when the peloton rolls into the area of Valenciennes (sector 23), the course is exactly the same as in 2018. The total distance remains the same, even though the length of the Trouée d'Arenberg was revised to 2,300 meters based on more accurate measurements. The sector where the first real selection is made remains as brutal as ever, but it has been renovated under the supervision of Les Amis de Paris–Roubaix over the last few weeks. "Having to change the course in the event of rain was becoming an increasingly likely prospect, so the Hauts-de-France region and other levels of government involved granted a subsidy to clean up the cobblestones, which had become swamped by mud and grass", explains race director Thierry Gouvenou. "We used pressure washers to get rid of the dirt and filled the gaps with mortar to restore the first 500 meters on a descending false flat to good condition." Another 400m stretch will undergo the same procedure right after the race. Moreover, a crowdfunding campaign will be launched soon to raise money for the works needed to keep the Trouée d'Arenberg on the course of Paris–Roubaix for the foreseeable future. Since turning pro, Zdenek Stybar has ridden Paris-Roubaix on six occasions, and except for 2016 when illness prevented him from being in the mix, the Czech has always been one of the main protagonists, finishing in the top 10 five times, including twice in second place, each time being beaten only in the sprint on the legendary Roubaix velodrome. 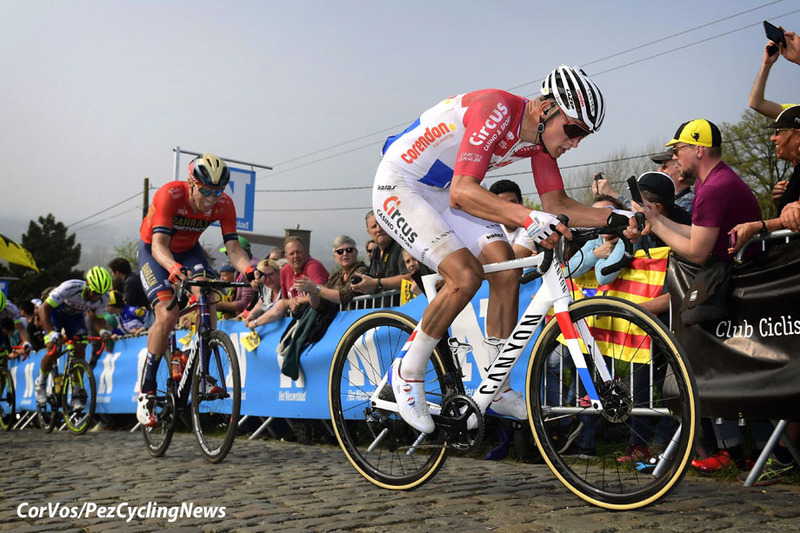 Victorious this season in two prestigious cobbled Classics – Omloop Het Nieuwsblad and E3 Harelbeke – the 33-year-old Czech hopes that his luck will change on Sunday, after a bout of illness spelled the end of his ambitions at Ronde van Vlaanderen. Jumbo-Visma will start Paris-Roubaix with Timo Roosen after he had to miss the Tour of Flanders. Amund Grøndahl Jansen will not be there due to a cold. The selection consists of five Dutch and two Belgians. 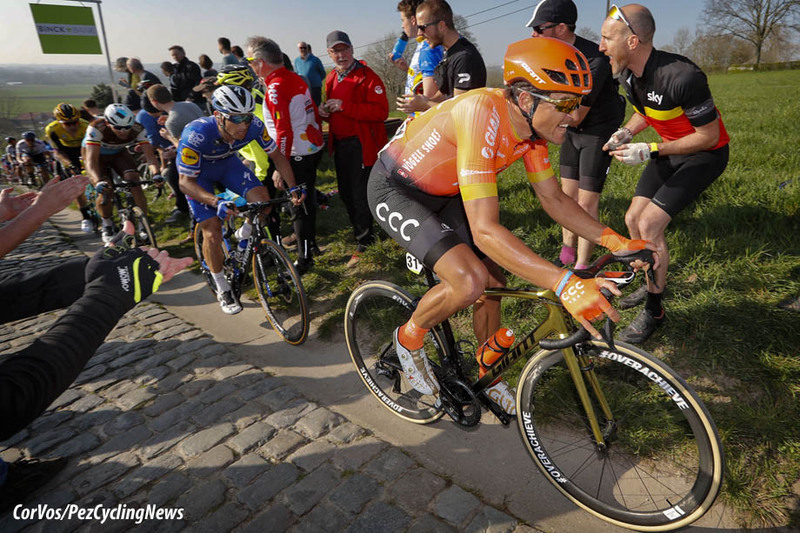 Wout van Aert hopes to recover from his somewhat disappointing Tour of Flanders, when he did not have the legs to compete for a top place. Mike Teunissen and Danny van Poppel should also count on a protected status. Last year Grøndahl Jansen was the best rider of the team in Roubaix in 16th place. 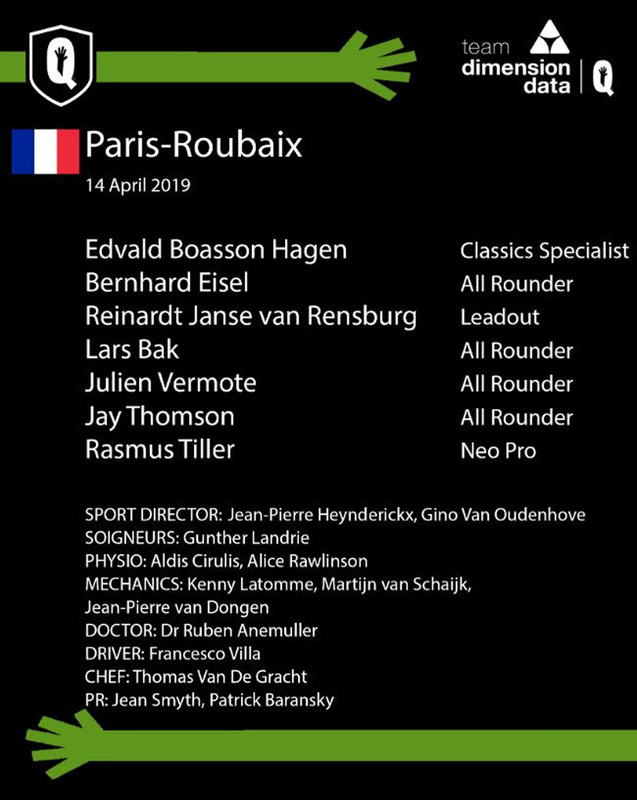 In the 2018 Paris Roubaix; Teunissen was 11th riding for Sunweb and Van Aert was 13th when he rode for Veranda’s Willems-Crélan. flag-be Wout van Aert (Bel), Pascal Eenkhoorn (Ned), Taco van der Hoorn (Ned), Danny van Poppel (Ned), Timo Roosen (Ned), Mike Teunissen (Ned), Maarten Wynants (Bel). 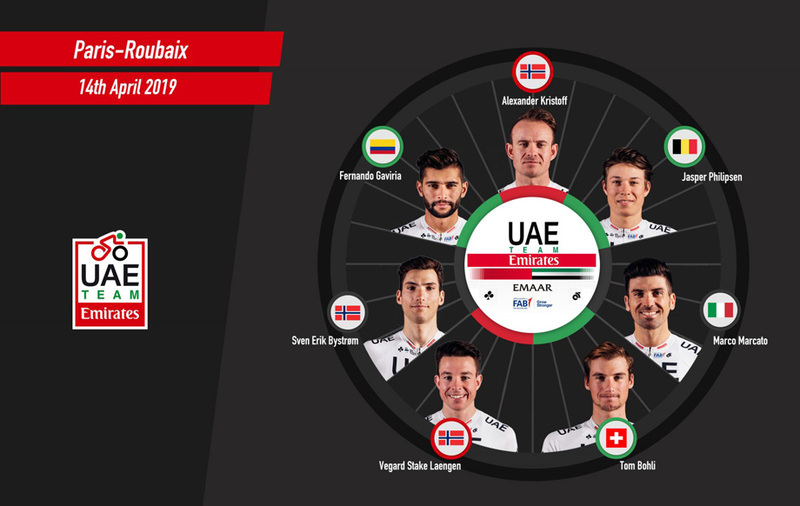 Marc Reef - Team Sunweb coach: "We start Paris-Roubaix with a very young group of riders, three of which are debutants and are all very motivated for what is always an incredible race. Our goal will be to ride offensively and fight for the early breaks and try to anticipate moves in the pre-finale, to put us in a good position on the crucial sectors. 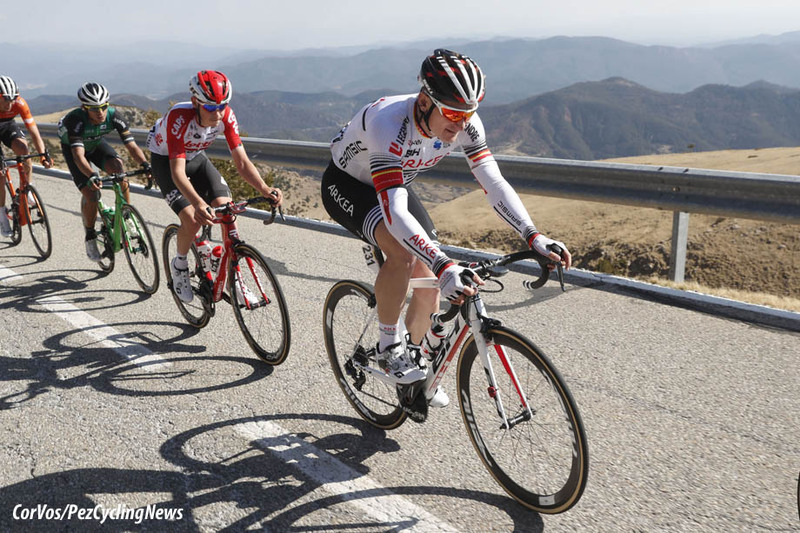 Cees and Nikias, who is recently back from a tough crash at Tirreno Adriatico, will be the guys to look out for in our line-up and we will work to set them up to be there in the final." Asbjørn Kragh Andersen (DEN), Nikias Arndt (GER), Cees Bol (NED), Roy Curvers (NED), Lennard Kämna (GER), Casper Pedersen (DEN), Max Walscheid (GER). Vincent Lavenu: "We are coming to Paris-Roubaix with big ambitions. Whether in Milan San Remo or Gent Wevelgem, Oliver Naesen has consistently proved that he is one of the best racers at the classics. At the Tour of Flanders, his big goal, he took 7th place in spite of the fact he was suffering bronchial issues. That bodes well for this coming weekend. Our hope is to reach the podium, and even a victory. We are looking for the big exploit. Since early March and the Omloop Het Nieuwsblad, the guys have raced together, they know each other well, and everyone, from the staff to the racers, are all very motivated. At the Tour of Flanders, we also saw how strong of a lieutenant Stijn Vandebergh can be. He was pushing at the front in the last hour of race. Of course, by mentioning Paris-Roubaix, I do not forget Silvan Dillier. He has not been overly successful at the classics so far this year, but he is able to transcend the situation, as he did last year by getting in the breakaway before taking second place in the Roubaix velodrome." 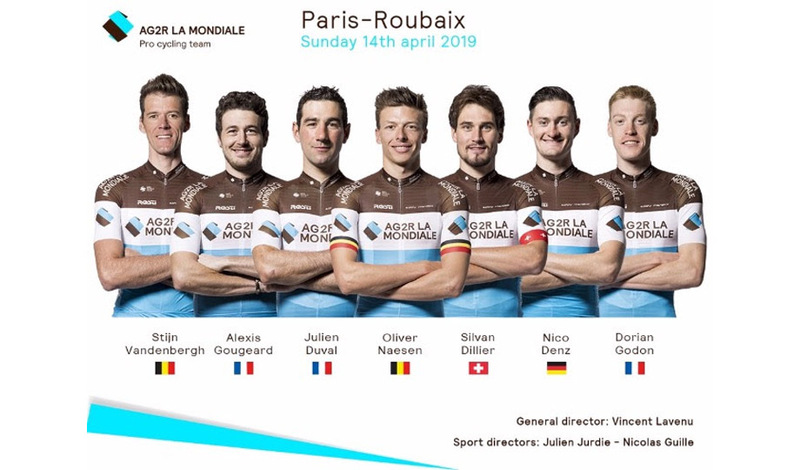 General Manager Joxean Matxin said, "Considering the good run of form and performances our cyclists have, we can look towards Paris-Roubaix with optimism. Our wish is to close the northern classics campaign with a significant result. Our goal is clear, a victory in the Hell of the North and just the desire to do well. We will have riders at his side to offer a great contribution and a Fernando Gaviria who, despite debuting in the race, has the necessary talent for to go strongly." The French ProContinental team, Arkéa-Samsic, has announced their team for Sunday. Their main-man will be André Greipel. The 36-year-old Greipel will be at the start with ambition. Two years ago he finished in 7th place. Last year Greipel was unable to participate due to a broken collarbone. The strong sprinter - who has only won once this season - will receive assistance from Bram Welten. The 22-year-old rider has been in good shape lately, he finished second in the Route Adélie de Vitre and rode well in Cholet-Pays de la Loire, GP de Denain and Nokere Koerse. The rest of the Arkéa-Samsic team are French: Franck Bonnamour, Brice Feillu, Benoît Jarrier, Alan Riou and Clément Russo. Franck Bonnamour (Fra), Brice Feillu (Fra), André Greipel (Ger), Benoît Jarrier (Fra), Alan Riou (Fra), Clément Russo (Fra), Bram Welten (Ned). Sports Director Fabio Baldato is confident in Van Avermaet and the team lining up at the Hell of the North. “Naturally, we are lining up at Paris-Roubaix with Greg Van Avermaet as our leader. Greg has proved that he is one of the strongest in the Classics and as the winner of the race in 2017, we know that it is a race suited to him. It would be a dream to win the race again. Of all the Classics, Paris-Roubaix is the most unpredictable which can be both a good and bad thing. With more than 50 kilometers of cobbles, it is a race that only the strongest of riders can win and we have a lot of confidence in Greg ahead of Sunday,” Baldato explained. 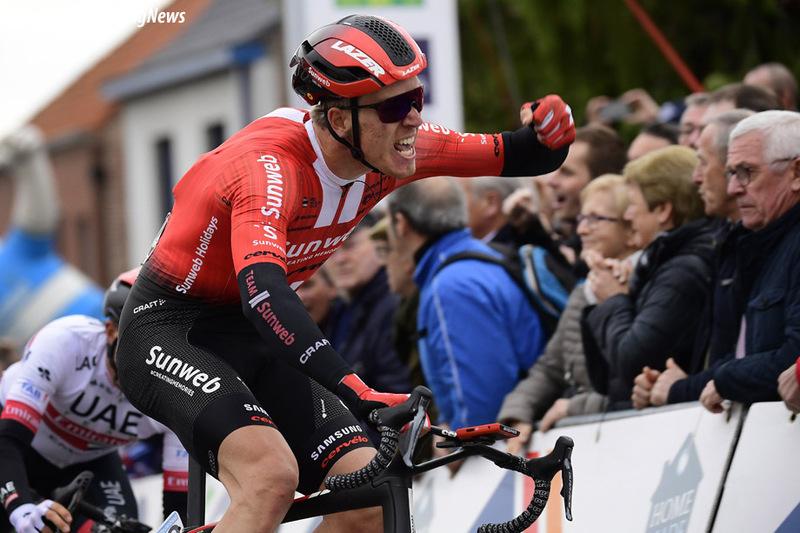 Greg Van Avermaet, who bounced back from two mechanical problems and went on to win in 2017, will be hoping to repeat his previous success on the unforgiving terrain of northern France. “I love Paris-Roubaix. Obviously, I make no secret of my desire to win the Tour of Flanders but Paris-Roubaix is a really special race for me. It was even before I won in 2017 and of course, since then it holds a special place in my career as my first and, so far, only Monument win. I would love to win it again,” Van Avermaet said. Kamil Gradek (POL), Michael Schär (SUI), Greg Van Avermaet (BEL), Gijs Van Hoecke (BEL), Nathan Van Hooydonck (BEL), Guillaume Van Keirsbulck (BEL), Łukasz Wiśniowski (POL). Sports Directors: Fabio Baldato (ITA), Valerio Piva (ITA). Rasmus Tiller said: “My form is certainly getting better, I’m not where I was hoping to be this Spring, playing catch-up since getting sick but my plan earlier in the week was to try and attack at Schelderprijs and see how far I could get. I didn’t get to the finish line, well I got there eventually, but not first, and I was happy to get through without any issues. So that’s good and I’m now looking forward to Sunday. “In terms of Sunday’s race, luck does play quite a big factor: you need to have plenty of form, you need to have a lot of luck but you need to try and stay in front and out of trouble, then it’s a good chance to have a good day.” – Edvald Boasson Hagen. “As a team we have a couple of really strong riders that we will be looking at doing well. Edvald for instance was 5th year a couple of years ago and some of the others have finished similarly in the past, so we’re really looking forward to Sunday.” – Jean-Pierre Heynderickx. The four-time Tour de France winner, also king of the last Giro d’Italia, will lead Team Sky in their final display in a stage race under the current naming. An exciting edition (April 22-26) presented in Kufstein, with ten GT crowns among the two top names. That’s the major news announced on Wednesday April 10th in Kufstein (Austria) where the 43rd Tour of the Alps (April 22-26) will set off, and where a presentation was held with just 12 days to the start. Taking part in the press conference were Tirol Werbung's Executive Director Florian Phleps, Kufsteinerland Chairman Johann Mauracher, Kufstainerland Director Stefan Pühringer, Alpbachtal Seenland Head of Marketing Michael Mairhofer and Austrian former pro rider Thomas Rohregger. A few months after the World Championships in Innsbruck, Tirol is about to stage another major challenge between cycling giants: Froome is set to test the ambitions of a major Giro d’Italia contender, Vincenzo Nibali (Bahrain-Merida). 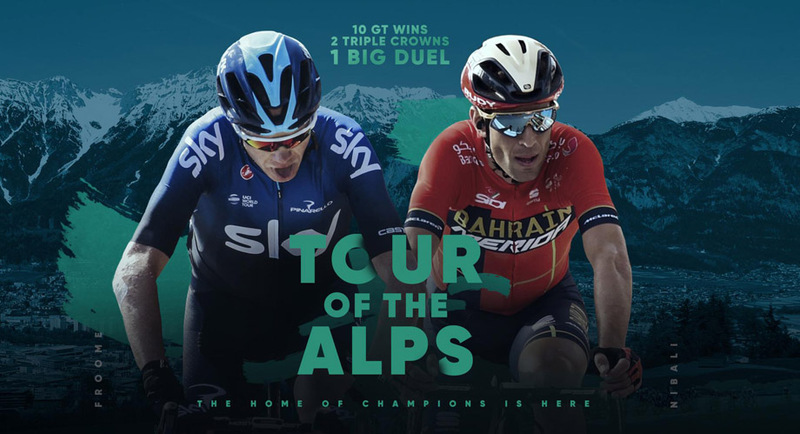 Ten grand tours won between those two: the Tour of the Alps is eager to welcome the two greatest GT riders of their generation, and among the very best in cycling history. Twenty teams will feature at thew Tour of the Alps, including five World Tour outfits: Team Sky and Bahrain-Merida will be joined by AG2R-La Mondiale, Pole Rafal Majka’s Bora-Hansgrohe, and Astana Pro Team, coming off three stage wins at 2018 Tour of the Alps, led by last year’s winner in Folgaria, Spaniard Pello Bilbao. The starting line-up in Kufstein will be rounded out by nine Professional teams - Italian Androni-Sidermec, Bardiani-CSF, Nippo-Fantini-Faizanè and Neri-Selle Italia-KTM, Spanish Euskadi-Murias and Caja Rural Seguros-RGA, French Arkea-Samsic, Russian Gazprom-RusVelo, and Colombian Manzana-Postobon, - Italy National Team and five Continental outfits – Italy’s Team Colpack, Romania’s Giotti Victoria-Palomar and three from Austria, Tirol Cycling Team, Felbermayr-Simplon-Wels and Team Vorarlberg-Santic. After the New Zealander’s contract was not extended following the 2017 season, Archbold is now making his return to BORA – hansgrohe, in order to bolster the lead-out of our strong sprinters, Sagan, Bennett and Ackermann. “With Sagan, Bennett and Ackermann we have three fast men, however, we felt that we needed to strengthen the team’s lead-out train and capacity to optimally prepare for fast finishes. Shane was already part of the team from 2015 to 2017, and we have great faith in his abilities. After his serious crash at the 2016 Tour de France, he experienced health problems, which rendered him unable to continue competing on the WorldTour. It was for that reason that we did not extend his contract. However, I assured him that if there was ever a chance for him to return to the team, then the door would always remain open. Now he is fit again, motivated, and ready to grasp this new challenge with both hands, and it is an opportunity that we are very excited to be able to give him.” – Ralph Denk, Team Manager. “This is incredible! I am so thankful to have received this great opportunity. The WorldTour will definitely be a challenge, but for me there is no better team with which to take on this challenge than BORA – hansgrohe. We have a common history and I also have many friends within the team. I just hope to be ready to show everyone that I deserve this opportunity.” – Shane Archbold. The next Hour Record holder? 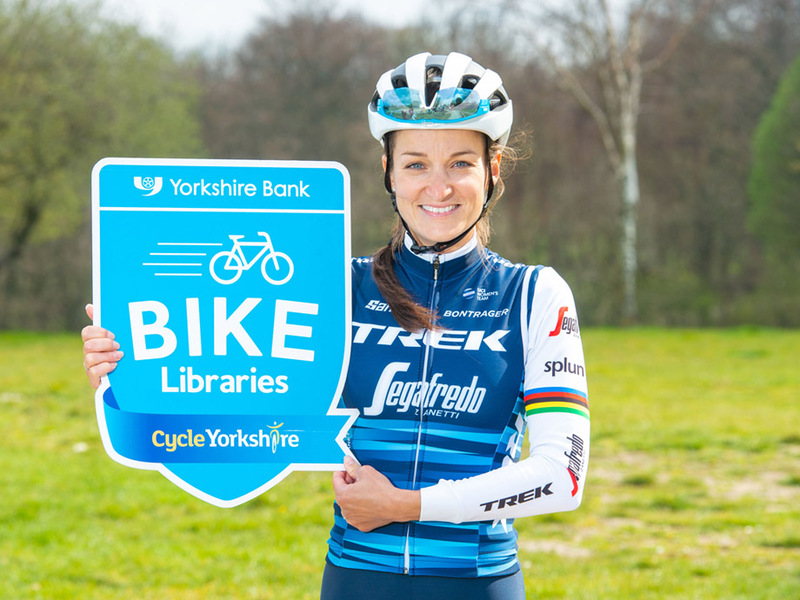 Home favorite Lizzie Deignan has confirmed she will ride the 2019 Asda Tour de Yorkshire Women’s Race. The 2019 Asda Tour de Yorkshire Women’s Race promises to be the biggest and best edition yet and has been moved to a Friday and Saturday (3-4 May) to enable more people to line the roadside and celebrate the race. For the first time as well, the two stages will be identical to those of the men, making it the longest and hardest edition ever with over 3,200 meters of cumulative climbing. There are plenty of other ways you can get involved as well. The Land Art and Best Dressed Competitions have both been launched and full details on how to enter those can be found at http://letouryorkshire.com/landart and https://letouryorkshire.com/bestdressed respectively. 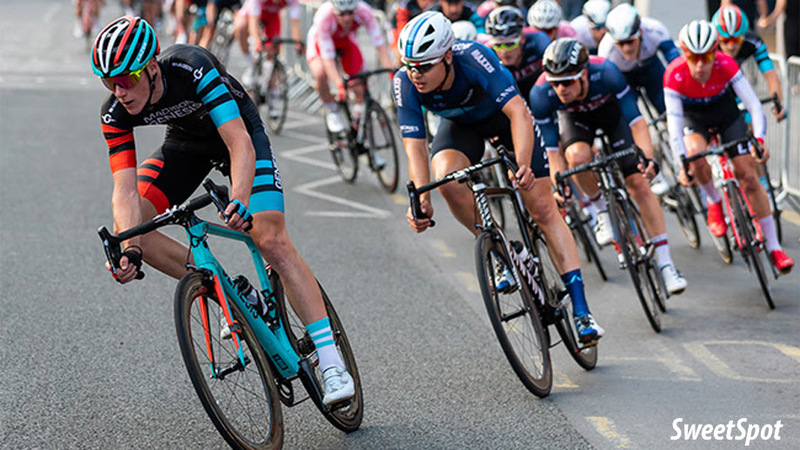 In 2019 the six registered teams competing for four invites to the OVO Energy Tour of Britain (Saturday 7 – 14 September) are Canyon DHB p/b Bloor Homes, Madison Genesis, Ribble Pro Cycling, Swift Carbon Pro Cycling; Team WIGGINS Le Col and Vitus Pro Cycling p/b Brother. The qualification process has been devised once again by SweetSpot Group, organizers of the Tour of Britain, and British Cycling, with full consultation of competing teams throughout. The six eligible teams will score points on a 10-8-6-4-2-1 scale based on either their highest overall finisher (best placed general classification rider for the multi-day events), overall individual standing (HSBC UK | National Circuit Series) or overall team standing (OVO Energy Tour Series). Teams will count their scores from all events, allowing for one dropped score of their worst result. Mick Bennett, OVO Energy Tour of Britain race director, said: "The team qualification process will once again reward the best teams for their performances over the course of the 2019 domestic racing season with a much-coveted invitation to the OVO Energy Tour of Britain. "The rules and regulations have been designed to ensure that the British racing calendar is supported to its fullest throughout the year, while also unequivocally acting as the fairest way of recognizing our best-performing, UCI Continental-registered teams." Jonathan Rigby, Commercial Director at British Cycling, added: "We’re delighted with the events we’ve lined up for this year’s HSBC UK | National Road Series and HSBC UK | National Circuit Series, which are both set to be fantastic showcases for the sport, taking place in great venues across the country. In finalizing this qualification criteria for the OVO Energy Tour of Britain, and presenting teams, riders and spectators with the pathway to this country’s biggest annual event, we are setting up what should be a terrific season of racing." Relaunched in 2004, the OVO Energy Tour of Britain boasts a prestigious roll call of former winners including Julian Alaphilippe (2018), Sir Bradley Wiggins (2013) and Edvald Boasson Hagen, 2009 and 2015). The 2019 race route will be unveiled at the national launch in May. 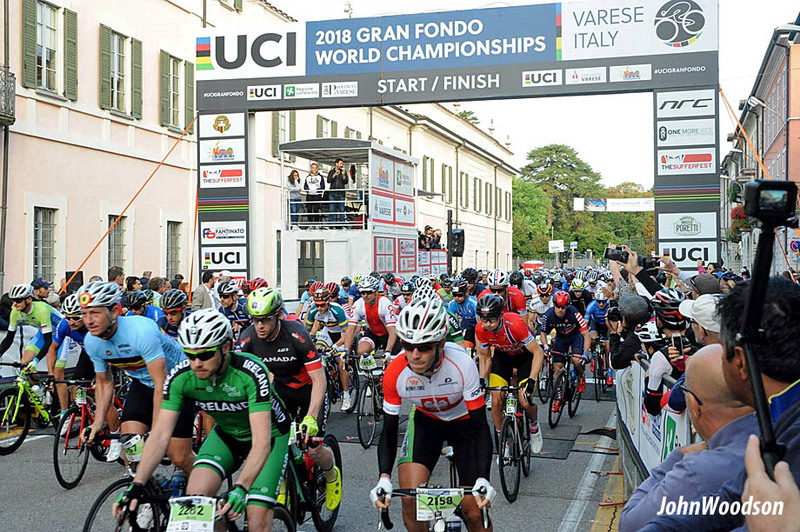 The first edition of the Granfondo European Championships will be held on 9 June 2019 in Verona (Italy), an event included as part of the "Granfondo Alé la Merckx" that will be raced on a 129 kilometer circuit with a total altitude of over 2.600 meters. Eight titles will be awarded in the Men’s and Women’s categories of a discipline that is very active and has always represented an expression of passion for cycling. Rocco Cattaneo, Union Européenne de Cyclisme President: "The creation of the Granfondo European Championships is another step towards achieving the objectives that we set in our development plan. The mass cycling movement is continually developing as we have witnessed with the extraordinary success in terms of participation of our events in the Masters, Cyclo-Cross and various MTB disciplines. The Granfondo Alé la Merckx is a reputed event within the gran fondo movement and is raced in a beautiful landscape giving its competitors infinite sporting, cultural and tourism opportunities, it will start from the charming Piazza Bra and finish at the famous Verona Arena, which will host these historic Championships. I would in particular like to thank the company Alé, our sponsor for many years, its CEO Alessia Piccolo, for the passion and enthusiasm with which they have welcomed this event, the City of Verona, always devoted and at the service of cycling as well as the Italian Cycling Federation." Granfondo information and Granfondo European Championships Technical Guide – click here. Information Granfondo Alé la Merckx – click here. The German fast man shares his journey back to elite form after a serious crash in 2016, culminating in his 2018 Tour de France Stage win.